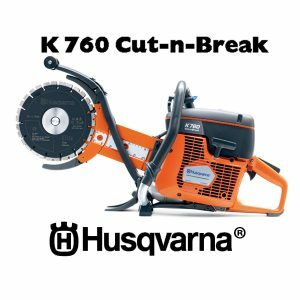 The Husqvarna K760 Cut-n-Break now has a new type of Cut-n-Break blade, with an improved stable core and cutting performance. The saw can cut in stages through walls up to 400mm thick. With a standard engine of 73cc, the CutnBreak has taken a big step toward increased cutting capacity. Additionally, the power cutter features reduced noise levels and a high-efficiency vibration dampening system. Equipped with the new generation of Active Air Filtration™, one of the market’s most efficient centrifugal air cleaning systems, you can get up to one year’s operation without a filter change. The K-760 Cut-n-Break is easy to operate and maintain, with low service and tool costs. It is also outfitted with an X-Torq® engine, which reduces emissions up to 75% and lowers fuel consumption by 20%. It is very easy to start thanks to air purge and a decompression valve.